There are only 3 available. This rare 1/60 scale, 2" long toy is really cool. There are only 2 available. This rare 1/60 scale, 2" long toy is really cool. There is only 1 available. This rare 1/60 scale, 2" long toy is really cool and comes in the original box. There is only 1 available. This rare 1/60 scale, 2" long toy is really cool. 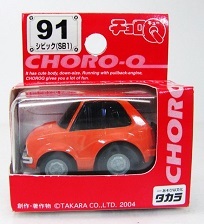 This is a great 2+" long diecast produced by Kyosho. The quality and detail is absolutely incredible for this scale car. It is in perfect condition and comes in the original box, which was opened to inspect the CRX inside. There are only 3 available. This poorly detailed, 2.5" long diecast is still collectible.